Even as their Sensex target moved from 36,000 initially (in November 2014) to 32,000 (FY16 Sensex EPS estimate of Rs1600 at 20 X forward P/E), the cuts resulted primarily from a cut in our bottom-up earnings estimates. Through these cuts, we kept the trailing Sensex P/E target unchanged at 20x on the premise that the structural positives emanating from the current dispensation’s three key resets should improve the long-term economy fortunes of India. Ambit believes that the failure on the part of the Government to get GST Bill & Land Bill passed will delay the economic revival that formed the basis of their rationale to assign a 20x multiple to FY16 Sensex estimate [ Rs 1550]. In the light of these risks, they scale down the Sensex P/E multiple to 18x, in line with the historical (last ten-year) average. 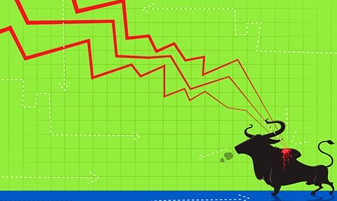 What are the Chances SENSEX will Fall to 22,000 ? In the past we have seen during Global Financial Crisis of 2008 led by the fall of Lehman Brothers, Trailing SENSEX EPS P/E fell to as low as 14. If that were to happen then at Rs 1550 8 14X can bring the SENSEX down to a low of 22,000.